The theoretical work of the American physicist Richard Phillips Feynman (1918-1988) opened up the doors to research in quantum electrodynamics. He shared the 1965 Nobel Prize in Physics. Richard Feynman was born on May 11, 1918, in Far Rockaway, a suburb of New York City. He lived there until 1935, when he left to attend the Massachusetts Institute of Technology. After receiving a bachelor's degree in physics in 1939, he went to Princeton University, where he received a Ph.D. in 1942. While at Princeton, Feynman worked on the Manhattan Project, which eventually led him to Los Alamos, New Mexico, in 1943 to work on the atomic bomb. In 1946 he went to Cornell University, where he remained as an associate professor of theoretical physics until 1951. He spent half of that year in Brazil lecturing at the University of Rio and then became a Tolman professor of physics at the California Institute of Technology, where he stayed for more than 30 years. He had three wives and two children, Carl and Michelle. Feynman's primary contribution to physics was in the field of quantum electrodynamics, which is the study of the interactions of electromagnetic radiation with atoms and with fundamental particles, such as electrons. Because the equations that compose it are applicable to atomic physics, chemistry, and electromagnetism, quantum electrodynamics is one of the most useful tools in understanding physical phenomena. The field initially grew out of work done by P. Dirac, W. Heisenberg, W. Pauli, and E. Fermi in the late 1920s. The original theory was constructed by integrating quantum mechanics into classical electrodynamics. It provided a reasonable explanation of the dual wave-particle nature of light by explaining how it was possible for light to behave like a wave under certain conditions and like a particle (a "photon") on other occasions. Dirac in particular introduced a theory that described the behavior of an electron in accordance with both relativity and quantum mechanics. His theory brought together almost everything that was known about particle physics in the 1920s. However, when the principles behind electromagnetic interactions were brought into Dirac's equation, numerous mathematical problems arose: meaningless or infinite answers were obtained when the theory was applied to certain experimental data. Feynman found a way to bypass, though not solve, these problems. Be redefining the existing value of the charge and the mass of the electron (a process known as "renormalization"), he managed to make the "divergent integrals" irrelevant--these were the terms in the theory which had previously led to meaningless answers. Thus, while some divergent terms still exist in quantum electrodynamics, they no longer enter the calculations of measurable quantities from theory. The significance of Feynman's contribution is enormous. He gave the theory of quantum electrodynamics a true physical meaning as well as an experimental use. The renormalized values for the electron's charge and mass provide finite, accurate means of measuring electron properties such as magnetic moment. This theory has also made a detailed description of the fine structure of the hydrogen atom possible. It also presents a precise picture of the collisions of electrons, positrons (anti-electrons), and photons in matter. Feynman was awarded the Nobel Prize for his work in quantum electrodynamics in 1965, together with fellow American Julian Schwinger and Shinichiro Tomonaga of Japan, both of whom had separately developed similar theories, but using different mathematical methods. Feynman's theory was especially distinct from the other two in its use of graphic models to describe the intermediate states that a changing electrodynamic system passes through. These models are known as "Feynman diagrams" and are widely used in the analysis of problems involving pair production, Compton scattering, and many other quantum-electrodynamic problems. Feynman was fond of using visual techniques to solve problems. In addition to his Feynman diagrams, he developed a method of analyzing MASER (microwave amplification by stimulated emission of radiation) devices that relies heavily on creating accurate pictorial representations of the interactions involved. A MASER device is one that uses the natural oscillations of molecules to generate or amplify signals in the microwave region of the electromagnetic spectrum; they are used in radios and amplifiers, among other things. Feynman's method for analyzing these devices greatly simplified and shortened the solutions, as well as brought out the important features of the device much more rapidly. Feynman also worked on the theory of liquid helium, supporting the work of the Russian physicist L. D. Landau. Landau had shown that below a certain temperature the properties of liquid helium were similar to those of a mixture of two fluids; this is known as the two-fluid model. Feynman showed that a roton, which is a quantity of rotational motion that can be found in liquid helium, is the quantum mechanical equivalent of a rapidly spinning ring whose diameter is almost equal to the distance between the helium atoms in the liquid. This discovery gave Landau's theory a foundation in atomic theory. Richard Feynman did work in many other areas of physics, including important work on the theory of Beta-decay, a process whereby the nucleus of a radioactive atom emits an electron, thereby transforming into a different atom with a different atomic number. His interest in the weak nuclear force--which is the force that makes the process of radioactive decay possible--led Feynman and American physicist Murray Gell-Mann to the supposition that the emission of beta-particles from radioactive nuclei acts as the chief agitator in the decay process. 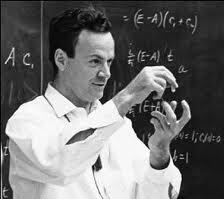 As James Gleick explained in Genius, Feynman also contributed to a "theory of partons, hypothetical hard particles inside the atom's nucleus, that helped produce the modern understanding of quarks." Quarks are the most elementary subatomic particles. Feynman wrote many theoretical physics books which are in use in universities around the country, as well as a series entitled Feynman's Lectures in Physics, which he put together based on several terms of physics lectures he gave at the California Institute of Technology in 1965. The lectures presented a completely revolutionary approach to teaching university physics, providing a valuable resource to all physics majors. He also dabbled in many areas outside of physics, including drumming and drawing. Feynman received the Albert Einstein Award in 1954, and he was warded the Niels Bohr International Gold Medal in 1973. He was a member of the National Academy of Science and a foreign member of the Royal Society in London. In January 1986, the space shuttle Challenger exploded above Cape Kennedy, Florida. Feynman was named to the 12-member special (Rogers) commission that investigated the accident. When public hearings began in February, the discussion quickly turned toward the effect of cold temperatures on O-rings. These rubber rings seal the joints of the solid rocket boosters on either side of the large external tank that holds the liquid oxygen and hydrogen fuel for the shuttle. Using a glass of ice water, Feynman demonstrated how slowly the O-ring regained its original shape when it was cold. Because of the O-ring's slow reaction time, hot gases had escaped, eroded the ring, and burned a hole in the side of the right solid rocket booster, ultimately causing the explosion of the space craft. In October 1979, Feynman was diagnosed with Myxoid liposarcoma, a rare cancer that affects the soft tissues of the body. The tumor from the cancer weighed six pounds and was located in the back of his abdomen, where it destroyed his left kidney. Feynman was diagnosed with another cancerous abdominal tumor in October 1987 and died of complications on February 19, 1988.